[Original 2010 Review] Ok, this probably counts as housecleaning #6. 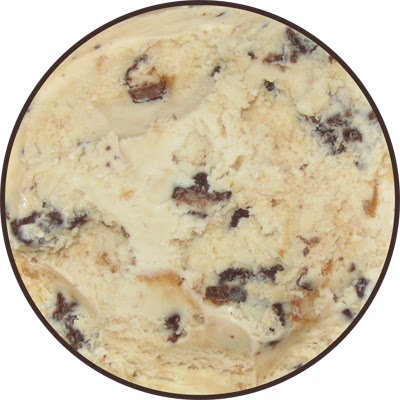 You may not believe this, but the selection of ice cream in the house at the moment is downright unbearable. The only thing I have right now is high octane stuff and a rogue container of turkey hill (which i will try to get up in the next few days). I knew my daughter could use some ice cream to wrap up her day, but I didn't want to go too chocolaty, so I went digging, and look what I found! 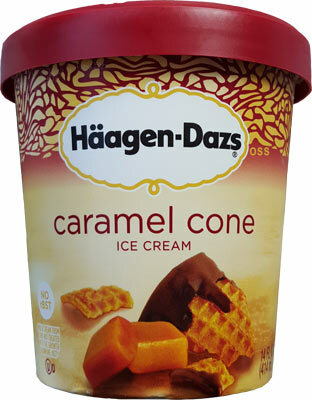 This is Haagen-Dazs Caramel Cone and it's best by 10/07/10... oops, that was last week, but it's only the "best by" date, not an expiration date. I didn't realize this pint had aged so much, but I hate to waste the good stuff. Well, I guess we are going for it anyway! just kidding. You want to know how a past "best by" ice cream tastes don't you? Well, the waffle cone bits have lost some of their crunch, and I do get a sense that the ice cream has been sitting a long time, but even with those two factors bringing it down, this ice cream is still simply amazing. The way the caramel comes across versus the chocolate waffle cone bits in literally every bite is just fantastic. 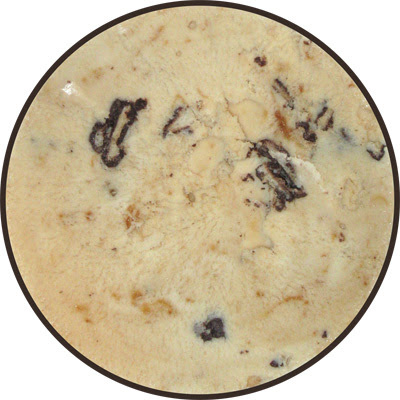 H-D makes such a great caramel base that's rich and real, not artificial or overpowering. Sometimes you actually get 2 or 3 cones bits in a scoop, it's crazy! Can you tell I really like this ice cream? I need more adjectives! Such a wonderful treat, what could ever possibly go wrong? Oh wait, this is Haagen-Dazs and the whole family is about to pay for our dinner time dessert. A single half cup serving clocks in at 31% of your total fat, a whopping 65% of your saturated fat, and don't forget 28% of your cholesterol!!! Whoa, wait, apparently this flavor has been tweaked since I bought it back in (iunno, spring?). It's now 29% total fat and 51% saturated fat. Still crazy, but at least a little less crazy. It's a shame this flavor is so unhealthy because boy am I impressed right now. Definitely a family consensus that this flavor is top notch. Nice job H-D.
Close Third: Breyers Waffle Cone OVERLOAD! 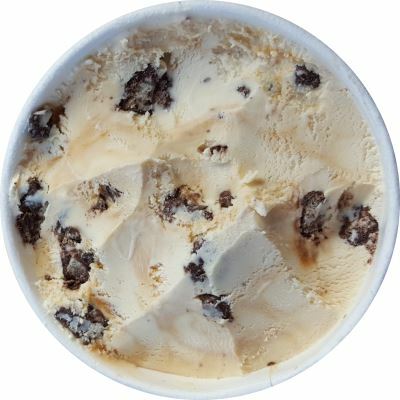 I've never tried Haagen Dazs, so I have a question. Whenever I have Ben & Jerry's, which is quite often, I find I have to let it sit out (of the freezer) for a good ten to fifteen minutes in order to let it soften up a bit, otherwise it's ridiculously hard, to the point of not being able to really enjoy it. 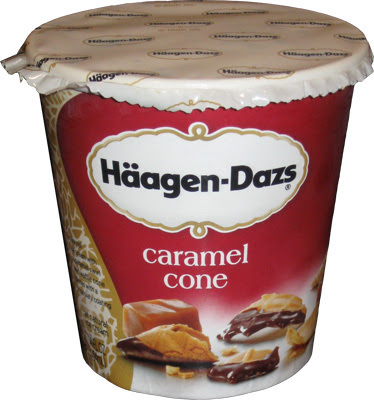 Is Haagen Dazs, as another high end ice cream company, like this as well? With Breyer's or Dreyer's/Edy's, after leaving it out for like three to five minutes, it's soft and ready to go. as a rule of thumb, the higher the fat content, the slower the melt. With that being said, for me it's one part brand, and one part "is my freezer defrosting right now?" Unfortunately, I lack neither the will power or the patience to wait 5 minutes, let alone 10-15 minutes, for my ice cream to melt. Thanks Dubba you sold me on Caramel Cone! Gonna try it ASAP. Keep on enjoying your ice cream experience! The first time I had Caramel Cone I was very disappointed because it didn't live up to my expectations, but since I enjoyed the Sea Salt Caramel Gelato so much I decided to give Caramel Cone another try. This time around was much different because I actually was able to taste the caramel ice cream and the caramel swirl individually. Not only that but I thought they both actually tasted like caramel this time and much richer than I had remembered during my first time. Now I see why this is your favorite among Cone ice creams because it is one of the best ice creams I have ever had. I used to dislike Haagen-Dazs but now I am beginning to appreciate their products more and more as I retry their ice cream flavors. I finally see why so many people like Haagen-Dazs because now I am a fan of Haagen-Dazs. no offense, but who thinks that far ahead when it comes to a snack? no way I could do it!